You would think that trying to persuade people that there is an alternative to surgery wouldn’t be too much of a problem, however cynicism and a lack of support from the NHS are powerful adversaries. Deep diving the complexities of bio-mechanics has been another sign of Toybox's ability to generate successful and insightful creative solutions. 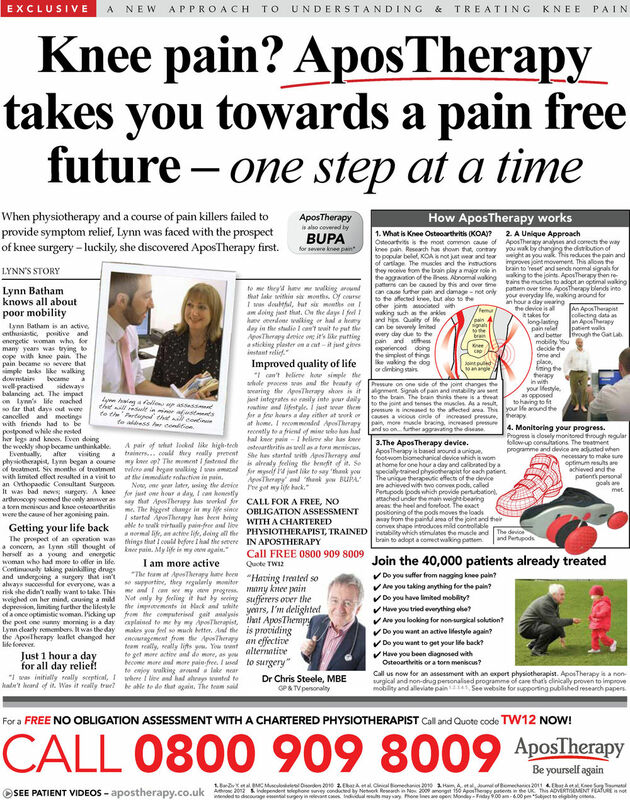 Assisting AposTherapy in expanding beyond their London clinic and small space ads to Birmingham, Manchester and Kent with a comprehensive creative strategy including full, 1/2, 1/4 page and small space work and a highly successful radio campaign. After careful consideration and many interviews gaining valuable insights, the agency recommended a radical treatment of its own. Continuing to apply the tried and trusted mechanics of direct response with a new and consistent brand style and a combination of educational and testimonial work rotated through a media cycle building brand exposure and knowledge for not only knee pain but also back pain sufferers. Paul also suggested and wrote the first direct response radio work for the client. The results led the client to double their radio media spend consecutively every month for several months.